Castleford Tigers’ prop forward Steve Crossley has left the club with immediate effect and joined Championship side Bradford Bulls. Crossley joined the Tigers for the 2015 season, on a two-year deal from Featherstone Rovers. 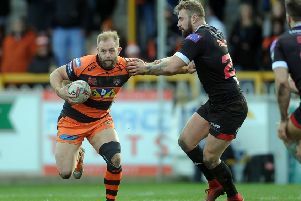 He played in all four pre-season friendlies for the Tigers and has made six Super League appearances, but has found it difficult to hold down a regular slot in the Super League side. Crossley is now looking forward to joining rejoining his home town club Bradford Bulls. He said: “After discussions over the past few days I’m happy to be heading back to my home town club. “My appearances at Castleford had become limited and game time, when picked, was very short. “I had initially set out to make a loan move to pick up my match fitness and game time but the opportunity arose to make a permanent move back to Bradford. Tigers chief executive Steve Gill praised the departing prop. He said: “Steve has been a pleasure to work with and a great bloke to have around the place. Head coach Daryl Powell said: “Steve Crossley has found it tough to consistently pin down a place in our first team during the first half of the season and obviously wants to play more rugby.